Like most musical genres, the term “symphony” is used in the present era for many different kinds of pieces. In my own music, I choose the name symphony not based on instrumentation, duration, or form; rather, for me a symphony is a piece that attempts (in some rather small way) to make an artistic comment on a “big topic,” whether that be emotional/psychological, societal, or natural. Thus, my first orchestral symphony dealt with light, the second love, the third loss, and my organ symphony the tools that enable societal violence. I most definitely do not see any of these works as being some sort of comprehensive “grand statement.” Rather, they are simply very individual responses to big ideas, perhaps analogous to writing a personal essay. 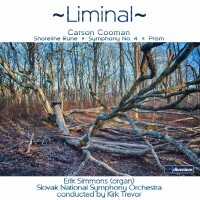 My fourth symphony, Liminal, addresses climate change—a topic at the forefront of discussion in the present time. The English word liminal comes from the Latin word for threshold. In social and cultural anthropology, the concept of liminality is used when describing rituals and processes; it refers specifically to the quality of ambiguity that occurs in the middle of the ritual, when participants are not the same as they were before the ritual began, but have not yet reached the conclusion. The piece is scored for an orchestra of brass, two harps, and strings. One harp is tuned a quarter tone lower than the rest of the orchestra, and the two harps together provide an uneasy, blurry tonal area through which the rest of the ensemble is led. In the first part, the two harps often sound together in a raw quarter tone “unison.” As the music moves along, the harps play trade off more, until in the final section only one harp remains. Some sort of transformation has been reached, or at least the search for light continues. The quarter tone contrast returns for the final chord. Perhaps the process only seems to be at an end from our limited perspective. The work was commissioned by the AR Trust and is dedicated to Augusta Read Thomas.